The Carriage House has its own garden entrance and is in its own private dwelling. This is the perfect place for families and parties of 4 to 5 people as it offers guests plenty of space, seating and two queen size beds! One you get here you will have your own driveway and enter in through a private garden entrance. There is an outside staircase that takes you up to a deck area that has plenty of seating, a table and a BBQ! Enjoy the views of the Puget Sound, Cascade Mountains and the beautiful gardens. Once you enter into this private guest house a spacious unit awaits you. The entire unit has just been updated with many things, furnishings, new bathroom vanity, window treatments, and more. Everything is located on the main living area with warm pine floors and area rugs to give it a soft feeling. This place is cozy with a wood stove to enjoy on rainy and cold evenings. (Your innkeeper will supply wood upon request, if available) The sky lights brighten this guest house and ceiling fan for those warm days. 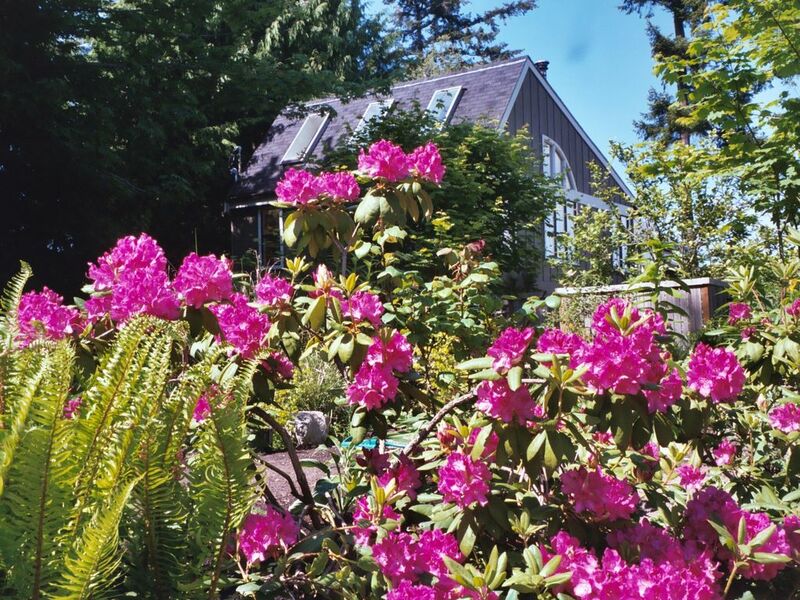 You will enjoy views of the gardens, flowers, fir and cedar trees as well as a view of Puget sound and the Mountains can be seen from the deck, master bedroom and the living room. Watch the birds as there are many here; humming birds, red headed wood peckers, starlings and the Bald Eagles are always soaring by. You can actually hear the wind underneath their wings. This unit has all the amenities you would want for a short or extended stay. This guest house can be rented long term during Fall through Spring at a great rate! You will feel right at home, very comfortable and feel like you are miles away from it all! Yet you are only a 5 minute drive to the ferry and 30 minutes you are in the great Emerald City 'Seattle'. The Carriage House has a full size kitchen with a stove range and oven, dishwasher, full size refrigerator, microwave, toaster, blender and a coffee maker. There are plenty of dishes, pots and pans and a dining table where you can enjoy your meals at. Nothing is lacking in this kitchen and the kitchen window you are looking out a the cedar trees giving you that Northwest feel. The bathroom has a shower with a new beautiful vanity with a black marble top and back splash with self closing drawers and shelving for all your toiletries, etc.. Skiff Point pampers its guests with plenty of towels, hand made soaps from Sweet Life Farms of Bainbridge Island, hair dryer, toiletries and robes are provided for your enjoyment. The master bedroom offers a queen size bed with luxurious sheets and closes off with glass French doors and curtains to give it a romantic feel but offers privacy from the rest of the house and your family members and friends. The bedroom also opens up out to the deck with glass French doors. It makes it a lovely place on a warm sunny morning and grab your cup of coffee and enjoy the deck from your bedroom with the French Doors opened. Enjoy all the birds and views of the ships going by as well as all the sailboats. The bedroom does have a closet, cabinet, bed stands, sitting chair and windows looking out at the garden, the water and mountains. There is a second queen size bed up in a cozy loft. The loft area is great for extra guests or other family members which is accessed by a comfortable railed ladder. There is a log beam that runs up along the ladder making you feel like you are up in a tree fort. Windows open up out to the cedar trees up in the loft so you feel like you are up in the trees. An airbed and air mattress are also available for those guests that do not wish to use the loft or you need for extra guests and family members. There is a one time minimal fee for guests using the loft to cover the cost of extra linens, and to have the bed made and loft area cleaned to make it very comfortable and clean for guests. The Living room is very spacious with two couches, chairs and a large flat screen television. For your entertainment there is dish satellite, blue ray player, CD/radio, cards, books, puzzles and games. This guest house is nice and spacious so the whole family can enjoy time together and yet have plenty of room. Guests are welcome to enjoy the gardens and encouraged to enjoy the main deck to enjoy the panoramic views. There are benches throughout the property for your enjoyment to view the birds, eagles, gardens, boats and of course the water, mountain and city views. In walking distance you can get to the beach, stroll along Manitou Beach and view beautiful Mt. Rainier and Seattle. Go to Rolling Bay Winery for some great wine tasting which is located right off Manitou Beach. There is the Rolling Bay Music Hall formerly called The Music Guild for occasional concerts which is just up the street from Skiff Point Guest House. Also you can walk to Rolling Bay Mercantile building which has been restored as it is historic and carries a lot of history of the island. It has a garden nursery as well as home nautical items, clothing and local organic produce including farm fresh eggs and milk. There is also a cafe to enjoy espresso, teas and daily baked pastries, bread and lunch as well. Across the street from there is also a mini market for the basics and an Italian Deli that serves lunch and dinner in a casual bistro setting or take back to your private guests house to heat up and enjoy with a view! They are known for their meatballs and the best pasta around! There are also lovely walks you can take in the quiet neighborhood, go down to the beach or walk the trails through the woods just across the street. There are bikes on the premises for guests to enjoy as well. Skiff Point Guest House is only a 35 minute ferry ride from downtown Seattle and then you are in the downtown area of Bainbridge Island called Winslow. Skiff Point is only a short 5 minute drive from downtown Bainbridge Island. Bainbridge Island is your great gateway to the Olympic Peninsula where you can explore many places; state parks, historic towns, beaches and many walking trails. There are many attractions and places to visit and only a short distance away. Be up in the mountains in an hour! On Bainbridge Island there is a lot of family fun things to do as there is a Kidi museum as well as the new art museum and historic museum for all to enjoy. Plenty of shopping, boutiques, galleries and restaurants here on Bainbridge Island. There is the Blodell Reserve which is a must see attraction which has many walking trails, an enormous variety of plants, trees, ponds and a Japanese Garden and structures including the Blodell Mansion that you can tour. Enjoy the Grand Forest, many trails and parks that Bainbridge Island has to offer. I do hope you decide to stay here and I would love to accommodate. You will love it here and I love to give my guests a memory of being pampered, feeling rested and I always leave fresh flowers and chocolates for my guests as well as lovely touches. All the windows have received new blinds and there are new couches in the unit as well. Some of the pictures do not show some of the upgrades this guest house has received. I am always trying to do something new every year to the properties here. Skiff Point Guest House was originally founded by Janice Parker. Jan's daughter; Kristin is the owner and hostess carrying on her mother's legacy. Kristin has been running the inn over the past several years now. This is a very special place to myself and my guests. I have had guests that have returned every year for the past many years which makes this a home away from home for many of my guests who have become dear friends. 'Come as strangers and leave as friends'. Following in my mother's footsteps I am carrying on her legacy..... I love making this a special place for my guests, giving them a wonderful place to stay and enjoy. I always leave little special touches for my guests including treats like dark chocolate, perhaps a bottle of wine for those that are staying for a week or more, fresh flowers, bath salts, and more... I want my guests to feel like they are really getting a treat and I love being an innkeeper. Your comfort is so important to me! My mother tastefully decorated the units with her gift of interior designing and a great eye for beauty! I had made some wonderful changes to the suites and am continuing to make upgrades to the units to make them more luxurious and inviting for everyone to enjoy. As your hostess I am happy to help you make your travel plans, personally talk to you about any questions you might have and provide all that I can to make your visit that much more special. Skiff Point Guest House is a special place to me as now its been passed down to my brother and I. This property made me want to leave California behind and stay here where it makes you feel at so much peace. Hearing the waves lap up on the shore and the Eagles soaring certainly make you melt into this beautiful home. The gardens and all the birds are wonderful to watch, even those occasional deer that want to eat the flowers and plenty of squirrels around too! I have to say the memories and all the guests that have come to stay year after year make it that much more special. You will fall in love with this place since you get a bit of everything, a view of the water (breathtaking), and the views of Seattle, the ship traffic going by, a walk in the forest or take a trail walk down to the beach simply makes it all a treasure. What a great location too! Only a 5 minute drive to the ferry and be in downtown Seattle in 35 minutes. The bathroom has a shower and toilet with a window to give you a view out. The bathroom has recently been updated with a beautiful new vanity with black marble and self closing drawers which gives you plenty of counter space. This bathroom does have heating and a fan as well as a small window which look out to the water. Views of 'The Emerald City & only a 35 min. ferry ride to Seattle. Views of Seattle at night are spectacular. Watch the sunset that glares its light on all the buildings makes it a fantastic view. Get out of the big city and enjoy a small town and feel miles away from all the noise. Feeling like you are miles away feeling the tranquility and being in the country. So much to enjoy here! Watch the waves from the bluff or the properties main deck. You will see many birds soaring above as the waves lap up on the shore. Plenty of boat traffic to watch with supplied binoculars. Panoramic views of Puget Sound, Mt. Baker to Seattle skyline. Beautiful sunrises and sunsets. Beautiful panoramic views of Puget Sound, watch the boat traffic go by from all around the world, to sail boats racing and pleasure crafts going by and of course Spring and Summer the cruise ships! If you need to use a phone, just ask your hostess and one will be available to use. All linens provided, luxurious sheets you will enjoy! There is a washing machine in a common area on the property for guests to use if staying longer than 3 days, exceptions are allowed if you need to use the washer and dryer. There is a dryer in a common area to use for guests staying longer than 3 days, exceptions are allowed if you need to use the dryer. Plenty of parking as the Carriage House has its own driveway and there is additional parking out on the street as well. Bikes and the laundry facilities are stored here. There are also garbage and recycling located in the garage. No cars are parked in the garage. There is free WI-FI Access! Plenty of nice luxurious fluffy towels are provided and fresh ones available upon request no matter how long your stay is. Locally there is a gym to use. There are two facilities on Bainbridge Island. Climbing and boxing gym just minutes from Skiff Point or the fitness center in downtown Winslow that is 5 min away. Wood stove insert in the living room to enjoy on any occasion. Ask your hostess for wood. Spacious living room, cozy up on one of the couches by the fireplace, or watch television or a great movie on a large flat screen. Full size refrigerator with ice trays. New GE Oven to accommodate any meal! Some items in the pantry, coffee, teas, flour, baking soda and powder, seasonings, oils and other passable items. Plenty of dishes and utensils for all your needs to entertain and for daily use. Plenty of space for dining and enjoying family time sharing a meal. You can also use the outside deck to enjoy a meal or use the properties large deck for great views while enjoying your meals! Yes there is an assortment of games and puzzles in the guest house for all to enjoy! Just ask your hostess for a list of DVD's Skiff Point Guest House has plenty of DVD's for your enjoyment. More bikes will be available to use, right now there are 2 adult bikes. Children's bikes will be available soon as well as additional bikes! There are boat rentals in the Eagle Harbor Marina as well as boat tours available in downtown Seattle. Just a 35 minute ferry ride and you are on your way to some water exursions. Only an hour and half away and you are up in the slopes! Yes! Lots of golfing in the area and one very close at Meadowmere. There is a pool just a short distance from Skiff Point. A great place to take the kids or for your own enjoyment and exercise. Enjoy the many attractions here on Bainbridge Island. Skiff Point Guest House is only 5 minute drive from the Seattle/Bainbridge Ferry. Located in walking distance to the historic area of Rolling Bay where you can enjoy the restored historic building Rolling Bay Hay & Feed, where there is shopping, organic produce, farm fresh eggs, a bakery to buy fresh baked pastries, bread and great espresso and other goodies. Across the street is a mini market and an Italian Deli known for the best meatballs around! You can walk through forest trails, and beach walks in the neighborhood. There is the music guild for concerts or events. Many parks and beach here on Bainbridge Island to enjoy like the Grand Forest and many other areas for some great walking trails and only minutes away, drive or ride a bike to the many locations. Plenty of maps and suggestions are provided, just ask your hostess. Loved the guest house with the great roomy loft. The water views from the deck just lovely. Enjoyed every minute of Bainbridge Island and the quaint Skiff point guest house. Thank you for your hospitality we had everything we needed for a relaxing stay. The wood burning stove was a cozy addition. Bay hay and feed just a short walk has such character and most anything you might need. Wonderful host, setting, and Home. Charming, quiet and picturesque location for a Bainbridge Getaway! Kristen couldn’t have been a more gracious and solicitous host. We received detailed descriptions of what we could expect of this VRBO before our arrival and then a wonderful welcome upon our arrival. The gardens are wonderful, the suite fully stocked with fluffy robes, thick towels and all the kitchen utensils needed for a vacation stay. Wonderfully located to the Rolling Bay shops for a quick take out dinner from Via Rosa when we were too tired (lazy) to cook for ourselves. We will be back! Very relaxing! We felt like we had a home away from home. We enjoyed barbecuing local fresh fish, walking up to the Italian restaurant in Rolling Bay, seeing the sights in Seattle and on Bainbridge Island, and enjoying a glass of wine in the evenings on the deck looking at the fabulous view. It is the perfect size for a couple. It might be a bit tight for more people. Paradise in a Carriage House! I cannot say enough good things about Kristin, the Hostess with the Mostess!! From the design and flow of her space, to the comforts of her bedding, couches, and the ability to cook and/or dine out, Kristin thought of everything. Even the "Walks of Bainbridge Island" book I accidentally swiped and will positively return! There was an electric grill for us to use, bicycles, little soaps and lovely coffee. Could NOT have expected anything more perfect! Thank you so much for staying with us here at Skiff Point in the Carriage House. The excitement in your faces upon arrival gave me such joy. So glad you loved everything even though we had a new road was being laid which is so exciting to have a smooth and safe road. What a blessing it is to have guests like you. I am so glad you enjoyed the Island and the berries that produce here in Summer. I have to thank you for the blackberries you had left! Cobbler turned out great! Mmm good! I am so glad you enjoyed the book called "Walks on Bainbridge". Its a great handy book to take along and find all the great trails on the island along with the detail and history of each walk. Nice the proceeds go to the Parks Department and the trails that are kept so very nice.. Those books tend to travel with guests and that's okay, its a great way to explore if you just want to enjoy as much time on the island, staying close yet venturing out... I am so glad you had fun! That is the most important thing I want guests to enjoy as well as enjoying your home away from home and feel like your miles away. Enjoying the view on your own deck with a barbecue or sit out on the large deck for the expanded views of Mt. Baker to Seattle! Enjoying the breezes coming up off the bluff to watching the eagles to the boat traffice. Seems like you all enjoyed it and not having more time.. It is my pleasure to leave robes, fluffy towels and those great little soaps hand made from Sweetlife farms here on Bainbridge Island in addition to luxurious linens and a great's night sleep.. When you have a chance to return do ask for a returning guest discount. Love to see my guests return year after year, "you are treasured!". Skiff Point Guest House would love to see you again. Take care and have a wonderful rest of the Summer and that you have a prosperous and happy year. Exceeded all expectations! Kristin's carriage house is wonderful! Cutest, cleanest, most wonderful! Where do I begin? Kristin is super nice and has set up the Carriage House perfectly! We loved everything about it. The place is well stocked with linens, extra bedding, air mattresses, and great kitchen supplies. The place was immaculate and super cute. Access to her beautiful deck gave us an obstructed water view to enjoy. Still, there is a nice view from the house both inside and outside on the great deck. We grilled out for two nights, which was great fun. We almost didn't want to venture out just sitting in the house was so nice and relaxing. I can't recommend this place enough. Top notch! I reallly hope to someday have a reason to go back! It was wonderful having you all stay here and so glad you enjoyed the large deck for the full views. I absolutely love being a hostess to my guests and putting a smile on everyone's faces, making you feel right at home. Providing guests with a clean place, luxurious linens, fluffy towels and hand made soaps is so important as well as having access to maps, and things to do in the area including a full list of dining choices. Having guests return is a real treat for Skiff Point Guest House and you get a discount too for returning! Truly it is a treasure to have guests like you. Thank you for staying here at Skiff Point Guest House. Best wishes to you and you'll have to return some time in the future. Have a fabulous rest of the summer. There is much to do when you arrive on Bainbridge Island. A must see is Blodell Reserve which has beautiful trails of endless varieties of plants and trees. Pritchard park memorial and it's sandy beach. There are 3 museums to visit; The art museum, Kidi Museum and the Historic Museum. Come in July for the Lavender festival in Sequim or the Garden tour here on Bainbridge Island. Great farmers market every Saturday from 9am to 1pm. Take a days trip over to Seattle for whatever you desire, fine dining, a concert or visit the Space Needle or an underground tour of Pioneer Square. You can leave your car here on Bainbridge Island and walk on the ferry and be in downtown Seattle in 35 minutes! Visit Port Townsend for many activities like a cider or wine tours (there are several to visit). Plenty of galleries and shops as well as restaurants. You can go up to Port Angeles for a trip over to Canada and see the beautiful city of Victoria. There is the crab festival in Port Angeles in October too! So many things, so many places and all within a short distance and a short time you can see it all but you must give yourself enough time so make it a long visit if you can so you can do all the things you would like to do or just relax here at Skiff Point Guest House and enjoy the breezes that come up the bluff, read a book out on the deck and just relax!. Skiff Point looks forward to having you stay and additional information is provided on how to get here, places to eat, things to do and other important information will be emailed upon receipt of payment for your reservation. Keep in mind that there is a charge for the use of loft and extra linens even if there are only 2 guests. This charge will be added if you request use of the Loft. This cost covers preparing and providing linens for the second bed. Stays 30 days or more there is no WA Lodging Sales Tax! Please ask for a special rate and discounts if visiting family and friends or if you are staying longer than a week. Skiff Point Guest House will love to give discounts to guests for returning as well as for longer stays than 7 days.